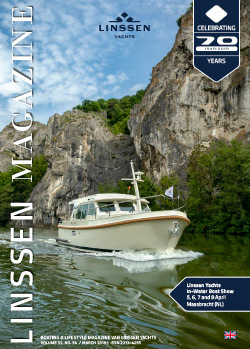 A Linssen dealer also began representing us in Sweden 2014. Linssen Yachts Sweden is based in Bromma, to the west of Stockholm, not far from Bromma/Stockholm Airport. A characteristic feature of the Swedish coast are the many skerries, hundreds of little islands which are actually the tops of hills rising up above water from the seabed. Between them, the waters are often sheltered, so that the sailing is excellent. The great thing about the Swedish coast is the beautiful scenery and the picturesque fishing villages with their typical wooden houses painted in different colours. The Göta Canal is perhaps Sweden’s most important engineering feat of yesteryear as regards hydraulic engineering. It is a 190 kilometre blue ribbon running from Gothenburg in the west to Sjötorp in the east and is Sweden’s top destination for motorboat cruisers. For a long time, the canal was of vital economic, infrastructural, and strategic importance for the country. Today, though, it is primarily a recreational magnet for water sports enthusiasts, cyclists and walkers. Each year, some 3 million tourists visit the canal and the attractive places along its banks. Because it is so long, you can always find somewhere to enjoy peace and quiet. For more information about cruising in Sweden, don’t hesitate to contact Linssen Yachts Sweden.